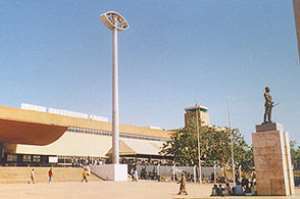 Accra, March 21, GNA - The total number of passengers through the Kotoka International Airport (KIA) has increased consistently over the years, rising from 622,525 in 2001 to 685,362 at the close of 2003. This confirms the fact that KIA has improved as an attraction and a preferred transit and final destination points due to the increasing status of Ghana as a safe haven and heightening tourism potential. The number, which includes passengers on non-scheduled airlines, had earlier risen to 636,114 in 2002, according to documents made available to the Ghana News Agency (GNA) Business Desk in Accra on Wednesday by the Ghana Civil Aviation Authority (GCAA). The document, which sought to show the number of passengers coming into and those leaving the country, had shown a considerable rise over the last couple of years. In the broader market, Ghana Airways carried most passengers in and outside the country posting 265,337 passengers in 2001. The total number of passengers on the national carrier dropped to 222,045 in 2002 dipping further last year to 213,661 amidst bankruptcy calls on the airline. The document indicated that Ghana Airways, however, was still leading in the total market share with 31.2 per cent of passengers coming and leaving the country between 2001 and 2003 while KLM Royal Dutch Airlines was second carrying 124,041 passengers in 2001 and 129,854 in 2002. The total number of passengers on KLM went up sharply to 130,445 in 2003, with hold of 19.0 per cent market share. The document said British Airways is third in line with very impressive rise in the number of passengers into and outside the country. The British carrier carried 74,803 passengers between the UK and Ghana in 2001. The number increased to 91,567 the following year, but rose significantly to 104,574 in 2003. British Airways, however, has 15.3 per cent of the total market share in the Ghanaian aviation industry. The pride of Africa, South Africa Airways carried 30,559 passengers in 2001, 32,912 in 2003 and 40,254 passengers last year capturing 5.9 per cent of the airline business in Ghana. Another African giant, Ethiopian Airlines had 30,542 passengers in 2001. This however, dropped sharply to 20,161 in 2002 to what industry analysts and aviation experts contend as the result of the September 11 crisis. The following airlines came in the order of listing Swiss Air, later known as SWISS, Alitalia, Lufthansa, Egypt Air, Middle East Airlines, Kenya Airways, Air Burkina, Air Afrique and Aeroflot. The rest, which constitute the non-scheduled airlines are Air Ghana, Imperial Air, Pres. De Senegal, Air Guinea, Camara Las Palmas, Chartered flights and other cargo. On aircraft movements, the GCAA named Ghana Airways, despite its problems, as the airline which had most flights: a total of 9,332 flights from 2001 to 2003. Ethiopian Airlines made 2,497 flights while KLM made 2,125 flights in and out of the country from 2001 to 2003 into other parts of the world. British Airways made 1,316 flights over the same period while South Africa Airways also made a total of 1,424 flights and Kenya Airways 663 flights. Lufthansa movements in and out of Ghana posted 1,131 flights and Alitalia 1,065 flights. Flights within the continent were not as frequent emphasizing the fact that African are not in the habit of travelling between their own to know about and do business. Industry analysts attributed the situation to debilitating problems affecting the airline, which has led to it to be grounded for the injection of a new lease of life with Nigeria Airways making two flights in 2001, none in 2002 and 2003. Egypt Air managed 330 flights in and out of Accra from 2001 to 2003 while Air Burkina made 144 flights, but on a diminishing note the 196 flights in 2001 dropped significantly to just 52 in the following year and none in 2003. Air Ivoire did not fly into the country in 2001. However, it made 122 flights in 2002 rising to 410 last year. Air Guinea made only two flights over the period. Total freight carried by both scheduled and non-scheduled flights was 133,339,065 kilograms. Ghana Airways and KLM however, topped in the number of airlines, carrying most freight hauling in, and out of Accra with 18.5 million kilograms and 18.2 million kilograms over the period. British Airways, which make daily flight flights, carried 15 million kilograms and Lufthansa 5.7 million kilograms. South Africa Airways and Kenya Airways carried goods weighing 235,555 kilograms and 233,609 kilograms haulage respectively.